The Edinburgh Integrated Catchment Study came about following the Flood Risk Management (Scotland) Act 2009. 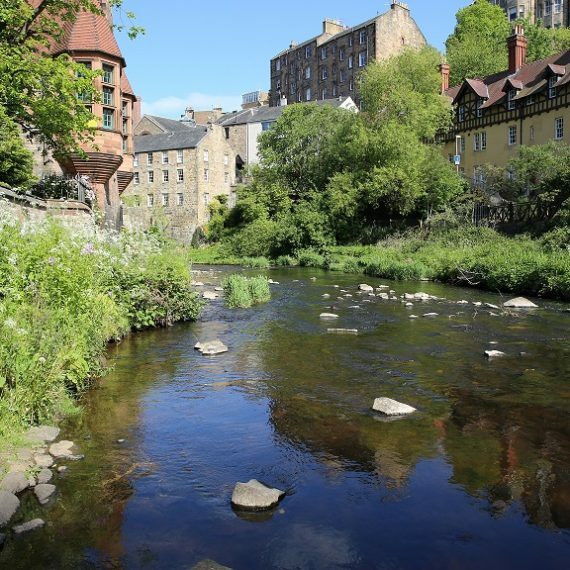 Richard Allitt Associates undertook the modelling of the whole Edinburgh catchment for Scottish Water. This included 87km of watercourses with 29 weir structures and 158 bridges, 204km of sewers, 230 modelled CSO and pumping stations and a total catchment population of 517,000. The final model has enabled full analysis of the catchment risks from sewer, watercourse and pluvial sources. watercourses & sewers. The project also had to integrate over 1000 river cross section surveys along with watercourse data from previous models, many of which had not been georeferenced. Since many of the watercourses were heavily wooded there were often differences between the LiDAR data and survey data. Many of the watercourses were heavily industrialised in the past leading to a significant number of weirs & mill ponds. As a result all the pools had to be modelled in the major watercourses. Richard Allitt Associates’ extensive hardware & software capability allowed 5,000 simulations of the 1D model to be run in less than 2 weeks. In depth knowledge & experience of the software, enabled us to overcome the complexities of running simulations in a model of this size and scale. A catchment walkover of the significant watercourses was conducted using a GPS enabled camera to understand them & their surrounding topography. Photos were taken at regular intervals capturing the watercourses and all key structures and features. These were then plotted in GIS software allowing locations to be quickly and easily reviewed at a later date. A comparison of the survey data to DTM was completed which allowed a better understanding of the issues. The discrepancies were generally caused by dense tree coverage which had the potential to significantly affect the out of bank flooding. This not only gave additional confidence to the existing data but also allowed these cross-sections to be better located where they were previously not georeferenced. Close attention was paid to the impact of discharge coefficients for the weirs in the watercourses. Some of these had a significant impact on the way that flows were simulated over these structures as well as the depth at which the weirs drowned out. FEH methodology was used throughout, due to issues with the use of ReFH in Scotland. However in the urban areas this was applied directly to the subcatchments & mesh whereas to model the rural inflows, a separate Flood Modeller model was used to reduce the complexity of the ICM model. The final model is being used for flood risk analysis, time series rainfall simulations & CSO spill analysis and more. By creating a fully integrated model with all the ancillaries and watercourse structures, a user friendly model has been designed fulfilling many different purposes.